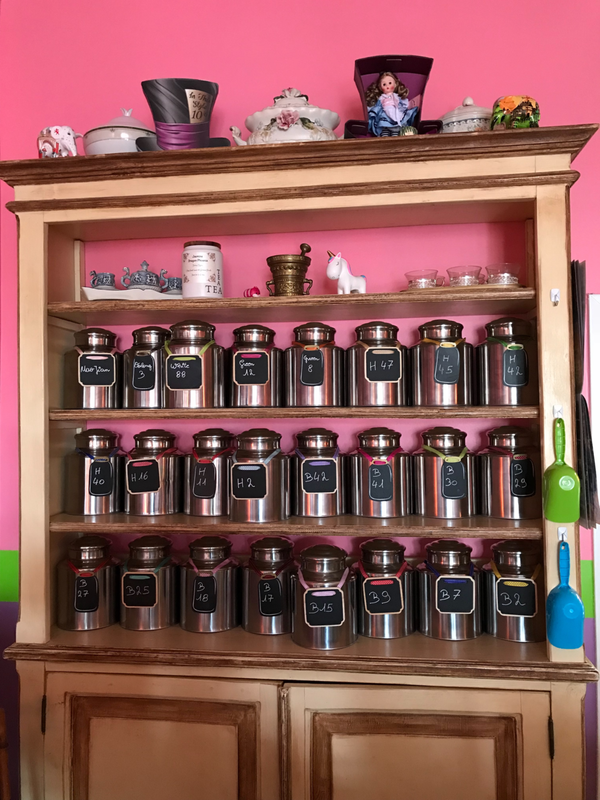 At Crazy Mad Hatter’s Salon de Tea, you’re greeted by the smell of home-baked goodies and a genuine, friendly welcome from Mark and Tonya, the sweet couple from Luxembourg who opened this unique, to-die-for tea spot just this year in Niceville, FL. Already a favorite among the locals, this adorable shop is filled with colorful and fun seating arrangements, an eccentric array of cheeky pillows and lamps and even bookshelves filled with reading material for the solo visitor. Wonderland’s influence peppers the environment: you’ll find a stand covered with mind-bending puzzle toys next to a wingback chair, mismatched china tea sets, and French-inspired artwork covering the pink and purple walls. Mark & Tonya came to America just a few years ago to visit family and fell in love with the area. Raised in South Africa, in a mainly British community, Mark was raised on hot tea and was surprised to find that it is not very common in our country. He says that in Luxembourg, there is a tea shop on every corner. He went on to explain that in the summer, the best thing you can do for yourself to beat the heat is to drink hot tea. It is normal for sports teams to drink a hot tea during the halftime portion of their matches, and Moroccans are known for keeping hot peppermint tea on them at all times so they can maintain their body temperature in the hot desert. According to science, the hot tea raises your body temperature, which causes you to sweat more and release the heat from your body. Considering how warm it gets here on the coast, this is definitely welcome information! Crazy Mad Hatter‘s Salon de Tea is the perfect environment for almost any get-together, whether it’s a birthday party, a ladies’ day out, a parent/child date, or a casual gathering. They’ll even set up after-hours events - just ask! Between the tarts and other sweets (even some gluten free!) – all from traditional family recipes – and their variety of quiches and savory items, every tummy will leave satisfied. And what would a tea room be without tea! Over 25 loose organic teas await your taste buds at this tea shop. From progressive Earl Grey with lavender and jasmine to herbal mint blends with licorice root, peppermint, fennel and basil, each blend is uniquely different and yields a distinct flavor profile. With such a vast array of options to choose from, whatever ends up in your cup is sure to delight you. Make sure Crazy Mad Hatter’s Salon de Tea is on your list of places to visit this summer!